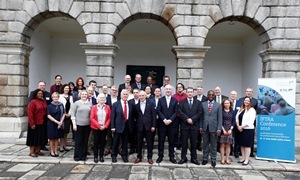 International delegates from a range of locations including Africa, the UK, North America, Europe, and Australasia met in June to discuss mutual issues and challenges related to the regulation and promotion of the teaching profession. Carmel Kerin and Peter Lind represented South Australia. Topics ranged from reforms in initial teacher education, induction and teachers’ professional learning frameworks as well as the challenges relating to reciprocity and mutual recognition across a range of international jurisdictions.Of particular note was Right Touch Regulation, a presentation and seminar by Harry Cayton, Chief Executive of the Professional Standards Authority, UK. These international networks enable us to assist teachers from South Australia working overseas, facilitate the movement of international teachers seeking to work in South Australia and allow the Board to better benchmark itself against best international practice. Expressions of Interest are invited from registered teachers of Indonesian who would like to attend the Australian Society of Indonesian Language Educators 2016 Conference: INDOVASI - menuju paradigma baru (moving into a new paradigm), on Friday 30 September - Sunday 2 October. The TRB has six sponsorships available. Find out more here. Australian Council for Educational Leaders 2016 Annual Conference – Leadership with insight & innovation. Wed 28th – 30th September, Melbourne Convention and Exhibition Centre. UniSA Connect offers a range of free teacher professional learning opportunities for secondary school teachers to support Science, Technology, Engineering and Mathematics (STEM), and Career Awareness in schools. Learning4all presents, Special Education Information Session: Supporting classroom teachers to differentiate effectively in inclusive primary classrooms, with Dr Jan Jarvis. Tuesday 2 August, 9.00am-3.30pm at The Highway, 290 Anzac Highway, Plympton. There will be a session for secondary classrooms on Tuesday 9 August at the same time and location. Australian Library and Information Association present their National 2016 Conference: Engage, create, lead at the Adelaide Convention Centre, Monday 29 August – Friday 2 September. SHine SA – Relationships & sexual health education – Secondary. What makes a comprehensive relationships and sexual health program, including content and teaching methods according to Principles of Best Practice, up-to-date sexual health information and statistics, a range of resources and curriculum outline and practical demonstration of classroom activities. Two sessions to choose from: 15 & 16 August or 13 & 14 October. Both sessions 8.30am – 4.30pm at SHine SA, 64C Woodville Road, Woodville. Are you a prep/reception teacher in a mainstream school who currently teaches a child with Autism Spectrum Disorder? A PhD student at Griffith University is conducting a survey for their research into improving outcomes for children with ASD. You can access the survey here . Please contact Rhylee Sulek if you have any questions: r.sulek@griffith.edu.au.